1 registered members (Admin), 12 guests, and 6 spiders. Use the 2002 NEC to provide a specific code section reference list of what you see wrong here and how you would write a violation notice. 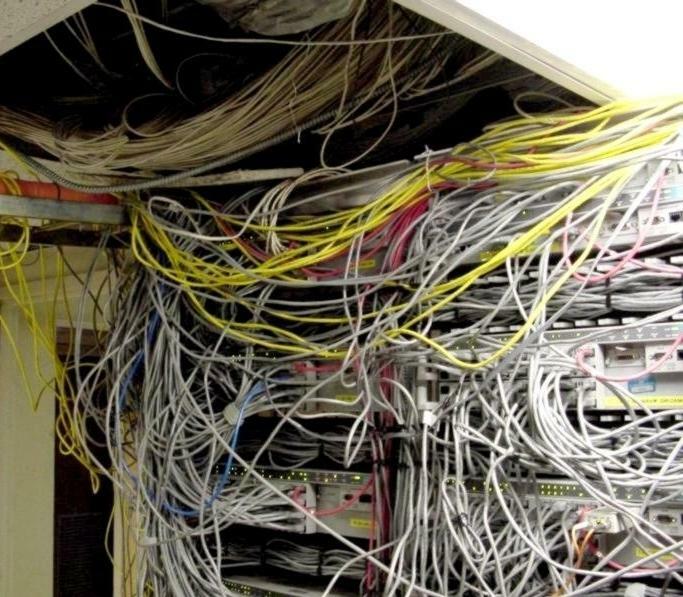 Looks like phone and network wiring, isn't it? My thoughts would be lack of support and too many wires. 800.5 Access to Electrical Equipment Behind Panels Designed to Allow Access. Access to electrical equipment shall not be denied by an accumulation of wires and cables that prevents removal of panels, including suspended ceiling panels. 800.6 Mechanical Execution of Work. Communications circuits and equipment shall be installed in a neat and workmanlike manner. Cables installed exposed on the outer surface of ceiling and sidewalls shall be supported by the structural components of the building structure in such a manner that the cable is not be damaged by normal building use. Such cables shall be attached to structural components by straps, staples, hangers, or similar fittings designed and installed so as not to damage the cable. The installation shall also conform with 300.4(D). ... "Cables and raceways shall not be supported by ceiling grids"
Per 90-3 Chapter 8 stands alone, so 300.11(A) doesn't apply to this installation. I don't see this rule in Article 800. For some reason I thought that the "loophole" had been closed with '02. It wouldn't be the fact that the computer lines are tyewraped to the armored cable in the ceiling would it? It is ugly but I have seen much worse.